With inequality rising and household incomes across developed countries stagnating, accurate monitoring of living standards cannot be achieved by relying on GDP per capita alone. 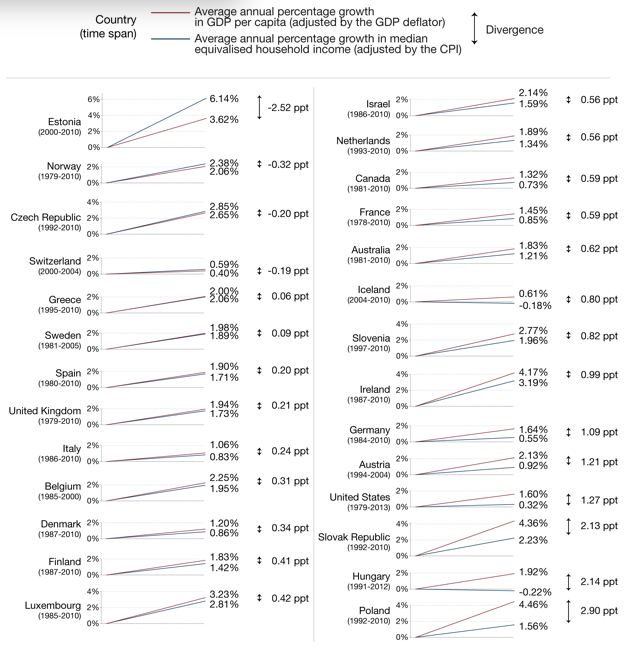 This column analyses the path of divergence between household income and GDP per capita for 27 OECD countries. It finds several reasons why GDP per capita has outpaced median incomes, and recommends assigning median income a central place in official monitoring and assessment of living standards over time. Increasing inequality and stagnating incomes for ordinary workers and their families are now at the centre of economic and political debate across the rich countries. Against that backdrop, the fact that median household income has lagged so far behind growth in GDP per capita in the US – widely attributed to growing inequality – has reinforced concerns about relying on GDP as the core measure of economic prosperity (Stiglitz et al. 2012, Oulton 2012, Van Reenen 2012, Boehm 2014, Coyle 2015, Furman 2015). 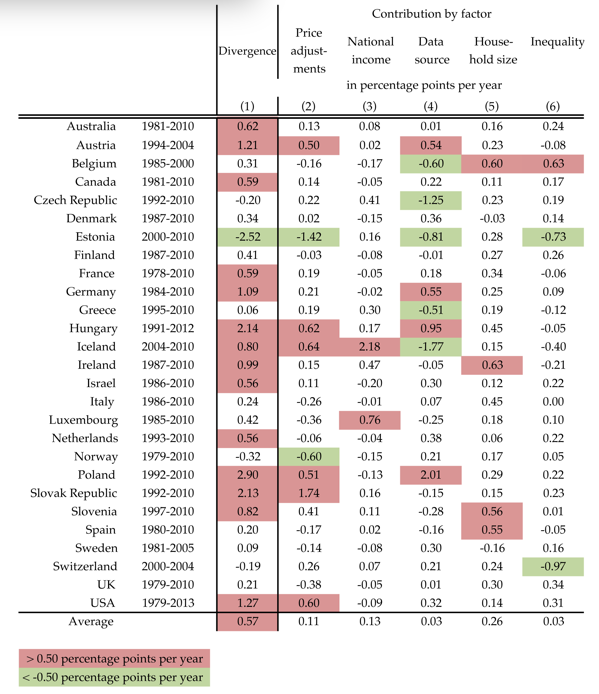 In a new paper, we analyse the extent of the divergence between growth in GDP per head and household incomes in 27 rich economies over recent decades (Nolan et al. 2016). We also assess the extent to which divergence between their trajectories is attributable to rising inequality versus other factors. We base our analysis on a new database of income levels across the distribution drawing on the Luxembourg Income Study (LIS) micro surveys and made publicly available (Thewissen et al. 2016). We find that while GDP per capita has outpaced the median in most OECD countries, the US is a clear outlier in the extent of that divergence. We also find wide variation across countries in the factors explaining this divergence, with decreases in household size being the most consistent contributor across countries. Even in the US, increasing income inequality is not the dominant factor. Because of the divergence between trends in GDP per capita and median household income, we recommend tracking both of these indicators to monitor and assess living standards over time. For our empirical analysis we start from the average annual percentage growth in GDP per capita deflated by the GDP deflator from the OECD national accounts. We compare this with the growth in real income for a ‘typical’ household, measured by median equivalised disposable household income from our dataset, deflated using the consumer price index (CPI). As Figure 1 shows, GDP per capita rose faster than median income in 23 of the 27 countries over the time span for which we have data for the country in question (this time span varies across countries as stated in Figure 1). Averaged across all countries, GDP per capita rose by 2.17%, whereas median income went up by 1.6% per annum, so the average divergence was 0.57%. The US is among the countries where that divergence is the greatest. Median income went up by only 0.32% on average annually between 1979 and 2013, whereas GDP per capita rose by 1.60% on average in real terms, leading to a divergence of 1.27%. What gives rise to this divergence? GDP per capita is deflated using the GDP deflator, which adjusts for price changes of all domestically produced final goods. Household income is deflated using the consumer price index (CPI), which adjusts for price changes of goods consumed by households. A higher growth in CPI relative to the GDP deflator indicates that households are faced with a faster price growth of goods that they buy relative to what they produce. GDP per capita captures total domestic economic output, whereas household surveys capture income flows only to households that are resident in the country. GDP is taken from the national accounts, whereas median income is derived from household surveys. Certain income sources such as imputed rent, retained profits, or in-kind benefits are part of GDP but are not reported in household surveys. Non-response and misreporting in household surveys can also affect the measurement of income levels. GDP growth is expressed in per capita terms. Median income is commonly measured as equivalised income, where total household income is divided by the square root of the household size, to take into account economies of scale in consumption when living together. Declining average household size will imply reduced economies of scale and will therefore lower growth in equivalised median income compared to a per capita income concept. Growth of GDP per head or mean household income, as averages, will outpace income growth at the median if incomes grow faster in the top half of the distribution as a country experiences rising income inequality. We can gain insight into which aspects are driving the divergence by successively bringing the measures more and more in line with each other. We do this in five successive steps. First, we correct GDP per capita by CPI instead of the GDP deflator to assess the impact of price adjustments. Second, we compare GDP per capita to GNI per capita (both CPI adjusted) to study the influence of the national income definition. Third, moving to mean per capita household income gives an indication of the importance of the different data sources. Fourth, to calculate the contribution of household size changes to the divergence, we compare mean equivalised income to mean income expressed per capita. In the fifth and final step, we look at the importance of inequality by comparing mean equivalised income to median equivalised income. Figure 2 exemplifies our decomposition method for the US. 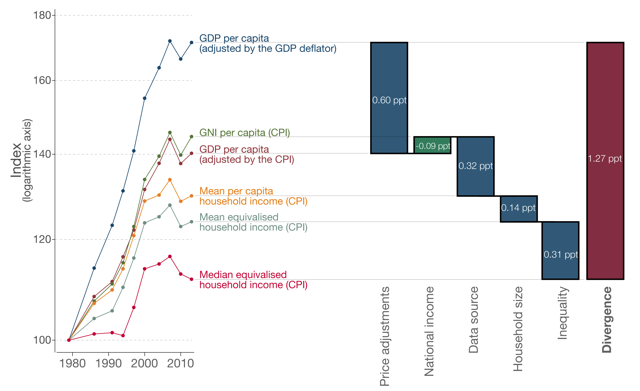 The left-hand side shows the trajectories of GDP per capita and median income and the intermediate variables over time. It shows that the divergence was substantial in most of the sub-periods, as median incomes were essentially stagnant except between 1995 and 2001. The right-hand side is a waterfall chart, indicating the annualised total divergence and how much can be attributed to different factors by comparing the evolution of different (intermediate) variables. From this waterfall chart we see the result that differences between price deflators, between data sources, household size and inequality all made substantial contributions to the divergence found. Note: The panel on the left shows income growth by various measures. The waterfall chart on the right decomposes the total divergence into the contribution of each of the five factors. Table 1 shows the role each of the factors played for all countries in our sample. Column 1 shows the total discrepancy between GDP per capita and median income in percentage points over the entire period for which data are available by country. Columns 2-6 show the percentage point contribution to the total divergence of each factor. As can be seen from Table 1, the mix of factors producing the divergence varies widely across countries. Still, we can draw a number of general conclusions, which are further supported by more detailed analyses in our paper, including analyses over time within countries (Nolan et al. 2016). We discuss the contribution of the different factors in turn. On average the different price adjustments contributed 0.11% or 20% to the average divergence. This implies that on average prices rose more for consumers than for producers. However, we find substantial heterogeneity across countries (and over time) in both directions for this factor. The difference between GDP and national income matters substantially only for Iceland, Luxembourg, and Ireland, which are countries with large net factor outflows to non-residents. For the discrepancy between data sources, the average adds little to the divergence when pooled across countries (0.03% or 5%). Yet, this obscures substantial differences across countries (as well as over time, as we show in the paper in more detail). This deviation between national accounts and household surveys is now much more widely recognised as a major issue for the measurement of living standards (Deaton 2005, Pinkovskiy, Sala-i-Martin 2016). On average across countries, household size is the most important factor, explaining 0.26% or 45% of the discrepancy. The widespread decrease in average household size has led to fewer economies of scale from living together in households, making growth in equivalised income lag behind per capita income. It is also the most consistent factor in terms of both the scale and direction of its effects across time. The only countries where average household size increased are Denmark and Sweden (so in Table 1 this factor has a negative sign for them, indicating that equivalised income grew faster than its per capita counterpart). Inequality has been frequently mentioned in the literature as a key factor why GDP per capita is insufficient in tracking living standards. However, its contribution seems to be modest on average, and also for the US – where inequality rose rapidly during this period – it was not the most important factor. The key messages from this analysis are first that median household income has lagged behind GDP per capita growth in most OECD countries, though generally less spectacularly so than in the USA. Second, a variety of factors have contributed to this divergence; there is not one universal explanation for the observed divergence. The decrease in household size, a largely neglected factor, is found to be the largest and most consistent contributor to the divergence. Inequality seems to play less of a role than is often assumed. Difference in data source and price adjustments matter less when pooled across countries, but show large variation across countries and time. Given that a gap between GDP per capita and median household income can arise from a variety of different factors, it is important to see the indicators together by assigning median income a central place in official monitoring and assessment of living standards over time. Thewissen, S, B Nolan, and M Roser (2016), “Incomes across the distribution database”.